I first went to Singapore in 1999 and used to joke that it was cleaner than Disneyland, just not as fun and that Singapore Airlines and Changi Airport were the best things about Singapore. However, over the last 15 years the city, state and country have done a tremendous job in changing that image which had been popularly held by most visitors. Nowadays, Singapore is teeming with life and offers a lot to visitors. It’s a new Singapore. Singapore realized that tourism was a great way to raise their national image, increase revenues and attract visitors. So Singapore invested in tourism. They took on international hotel and leisure partners, realized the value of parks (even in a hot climate like Southeast Asia), and dramatically altered the skyline to become one of the worlds best. I really believe that the Marina Bay Sands Hotel changed everything for Singapore. It is such a unique structure that everyone now knows. It is similar to how Dubai became internationally recognized with the Burj Al Arab. The views of Marina Bay from downtown or from the top of it overlooking the amazing rooftop pool are spectacular. It is one of the most photographable skylines I’ve seen-and I’ve seen them all! Singapore also introduced gambling. There is no denying this has had a positive impact on their economy and they have done it the right way. The casinos in Singapore are beautiful and well run. They are not seedy and the surrounding areas are not affected negatively; which had been some concern. Singapore realized that if they didn’t bring casinos in, another Asian city would and they’d lose all that revenue. I think it’s worked out for them. Singapore is also much more than tall buildings and big business. It is home to some of the nicest people I’ve come across and also some amazing food of varied ethnicities-like Singapore itself. The street food in Singapore is legendary and I can vouch for how good the food at the night markets can be. Singapore has also added some world-class restaurants to go along with its world-class hotels and infrastructure. 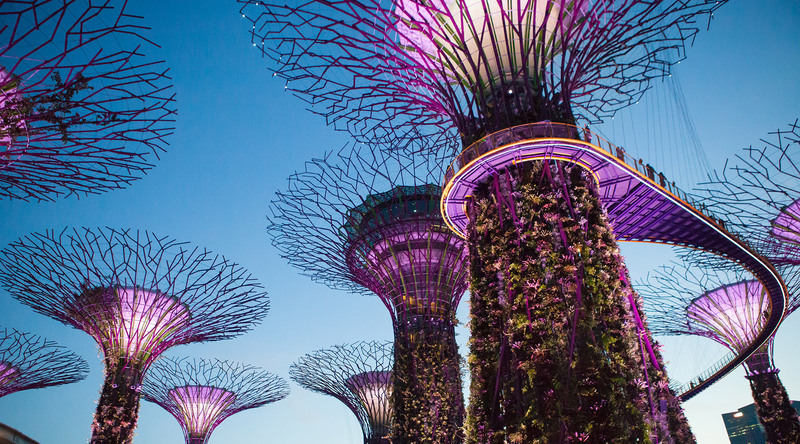 They’ve also added Gardens by the Bay; which is an awesome, futuristic part of their “City in a Garden” vision for their future. They are also touting it as the Central Park of Asia. It is really cool to walk around from ground level or up in the super-trees! I could go on and on about how much I like Singapore and how much it has changed since my first visit. I always look forward to going there and seeing what’s new! I can’t wait to visit again with Azamara early next year. Azamara has 18 upcoming cruises to Singapore. This Azamara Quest cruise departs Singapore on December 22, 2014, bringing you to Borneo for Christmas and Hong Kong for New Year’s Eve. On select 2015 & 2016 itineraries, you’ll receive 50% off your companion’s cruise fare when you book by September 30.